Cyber Monday vs. Black Friday: As the two streams of commerce – retail stores and online stores – converge, it’s hard to say where the best deals will be. And, of course, many of the stores that consumers might visit in person are the same brand names that one might visit online. But who ever said bargain hunting was easy? You have to do some homework. To scope out Cyber Monday, definitely check the CyberMonday websites, and also the sites of any of your favorite stores or brands. For Black Friday, check out the local newspapers, TV and radio ads, as well as looking online, on Thanksgiving Day. You can shop in your pj’s, from work, or while waiting for the plumber. 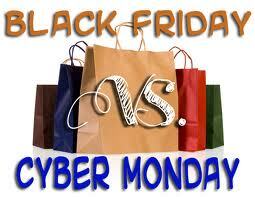 The five cons of Cyber Monday? You can’t “kick the tires” and see the merchandise, it might be hard to access a computer for shopping purposes, you’ll have to wait for shipping, and some people hate returning purchases by mail. Most importantly, your boss really might not love it if you spend Cyber Monday shopping at your desk! You can actually see what you are buying — measure it, try it on, see if you like the color. The prices might be better. Not everything that’s on sale on Black Friday will be available on Cyber Monday. It’s an outing. You can bring a friend or spouse for fun and advice. If you don’t go, you might miss some great bargains! The five cons of Black Friday? Some of the merchandise is lower-end; prices may continue to drop as the holiday season approaches; it’s too easy to over spend in the midst of a buying frenzy, it’s crowded, and the real bargains may be limited in quantity and sold to earlybird shoppers. So, when to shop? Whatever your personal answer is, the smart thing to do is decide beforehand not just what you want to purchase, but also your budget parameters. That way, come post-Thanksgiving Tuesday (a day for which, gratefully, there’s no retailing name yet), you won’t feel like a turkey with a hangover of buyer’s remorse!